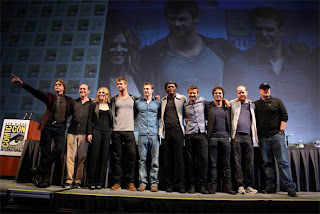 One of the big fandom squee moments at Comic-Con International this weekend was getting all of the main actors on stage with their director for the announced Avengers movie. 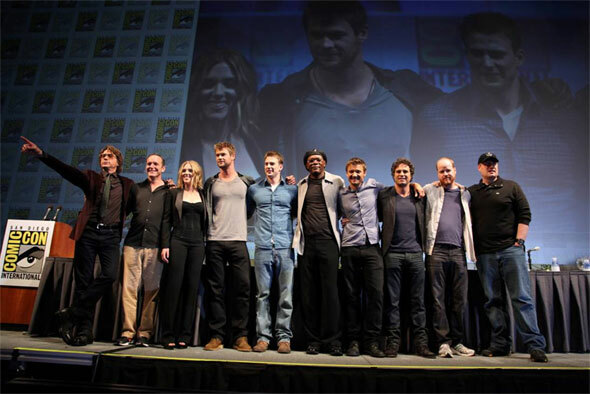 Samuel Jackson introduced about half of the members and Robert Downey Jr. introduced the other half. And with each name came increasingly more uproarious applause and cheers to the point where you could barely hear Downey bring out director Joss Whedon. I'm reading the news and watching the video clips and something about this whole thing just really bugs me. More than the usual well-the-comics-are-always-better-than-the-movie-adaptation thing. More than the typical when-did-comic-con-stop-being-about-comics thing. It's kind of hard to pinpoint, though, so I thought I'd try working it out here. I have not seen the Iron Man movies. I have not seen the Hulk movie with Ed Norton. I think the last Marvel Studios film I saw was Rise of the Silver Surfer. Before that, the first Fantastic Four film. My point being that I'm not invested in the franchise. I am familiar with some of the works of most of the players, and have a general respect for their abilities. I also have enough respect for Whedon's ability to write/direct a large/diverse group, so I suspect the final movie will be fairly well done and well received. My problem lies somewhere in the marketing and manufacturedness of the whole thing. Thor won't be released for almost a year. Captain America began shooting just a couple weeks ago. But hyping up The Avengers already presumes those two movies will do as well as Iron Man. Which they may, of course, but it's WAY too early to tell. I can understand and appreciate that, given the lack of creativity in movies these days, how an actor might be asked to sign a three-movie contract for any given film. If it turns out that a movie is really successful, studios want to be able to bring back the talent that helped make it successful. I get that. But there's something about engineering three movie properties independently with the deliberate attempt at later combining them into a fourth property that agitates every cynical bone in my body. I'm reminded of any number of comic book publishers who set out to create a world for their properties to inhabit. Where they don't launch one or two comics, but several, all of which tie together and mix in a way that seems contrived. They've largely gone down in flames, and the one that I can think of that started that way and is still around (Image) largely dropped the idea after a few months. The problem with that approach is that A) the initial stages of any creative endeavor have a lot of trial and error before the creators find out how the series best works, meaning that you can't adequately cross-pollinate stories like that before you've got a good handle on how they work internally, B) there tends to be more emphasis on creating a big sandbox where they all play over really good storytelling, and C) that sandbox notion comes across as driven primarily from a financial (let's see how much money we can bilk out of readers) perspective than a creative one. But isn't this what Hollywood does? Aren't I cynical enough to expect exactly this type of thing? It's possible there's a nostalgia factor here, but I'm skeptical of that. In the first place, I never really cared much for the Avengers. I never really understood Captain America and I just don't like Iron Man. In the second place, I gave up expecting to be entertained by Marvel's superheroes after their "Civil War" crossover. What they're producing just isn't my cup of tea any more. Third, as I noted above, I haven't seen the recent Marvel films that haven't launched this mega franchise. I keep going back to the manufacteredness of this whole thing. Every piece of it seems to ooze "We'll tell you what we want you to get excited about." Moreso than any single movie or franchise, really. Because with something like, say, Transformers or Pirates of the Caribbean, the producers are telling you to like one concept and a couple iterations of its execution. Here, it seems like they're saying, "Here's the Iron Man concept you should like. Now over here is this Thor concept you should like. And over here is this Captain America concept you should like. And over here is this Hulk concept you should like. Now we're going to tie these all together with this SHIELD concept you should like." As I'm thinking about it, too, it shouldn't work. The approach they took to Iron Man (contemporary statement about war and business) is vastly different to what they're doing for Thor (legendary story of sibling rivalry) which are both vastly different to what they're going to do in Captain America (a basic good versus evil period piece). I think they worked in the 1960s comics because A) you essentially had only a couple guys creating everything and B) they were all presented originally as simple superhero stories. Despite Stan Lee throwing in some occasional dialogue to distinguish one character from another, they all basically just fought evil because that's what heroes do. Now, to be fair, if anyone could make it work, I think Whedon could pull it off. And the cast includes plenty of folks that audiences love, regardless of what they're in. (I mean, seriously, they gave Jackson a pass for Snakes on a Plane, for Pete's sake!) But I get the feeling that very few people seem to see just how calculated and marketing-driven this Avengers property is. It seems like the fanboygasms are blinding everyone to how they're being manipulated, despite how blatant that manipulation is. I suppose that's what really gets to me. That people don't seem to be thinking for themselves on whether an Avengers movie may or may not work, they're just cheering because they're expected to. A few years from now, we might be seeing a really incredible Avengers movie -- which I'm sure a lot of people would love to see -- but, how about make some judgments of your own instead of relying on what a movie studio tells you? I think I get your point. But, for me - and I can only speak for myself - I'm excited to see an Avengers movie the same way I was thrilled to see an FF movie... I grew up reading these comics and it's just really cool to see these things in live action. Now, I was disappointed with FF in movie form. But at least it gave me a few cool moments of, yes, nostalgia and recognizing an easter egg here and there. That's all I pay my $10 for. And that's all I'm expecting. I think it's worth $10, for me. So yeah, I don't think the Avengers will be the most amazing movie ever, but I'm looking forward to it simply as a cool movie that will remind me of comics I use to read. I'm not going to be reading every interview from now until the movie is out, or look for pictures from the set (both things I couldn't get enough of with the first FF movie). But I will gladly plunk down my $10 to be entertained for 2 hours. Couldn't agree more. Not to plug my own blog, but as I noted there, I think the forced, absolutely hollow (so far as I can see) "exciting reveal" of the Avengers movie logo (a rendered version of... the Avengers logo... whooooo!!) kind of encapsulates the whole thing. It's worse than Malibu Stacy, honestly. I still have an interest in comics and want to have some sense of what's going on, but so much of what's being produced, and the coverage of it, leaves me asking "where's Jay Sherman when we really need him?" I don’t think anyone at Comic-Com was unaware that this is advertising/marketing. No one thinks that the girls in skimpy green hot pants and half-tops lounging in front of a Green Hornet car trying to get you to take a photo with them are doing so because they want to be with you. The ground outside the conference center towards Gaslamp Quarter each evening slowly got to the point that there was more pamphlet than pavement visible. No one’s being fooled there. I attended Comic-Con this year for the first (and probably only) time ever, and I’m still processing my own somewhat mixed impressions of it (by the by, I did not go to the session in question, nor any of the movie stuff – I’m line averse and, apparently like you, more than a bit people-averse). But… people go to those type of sessions because they’re fans of the thing being marketing, or the actors, or the directors, or something similar. If they don’t like it, or don’t want it to succeed, well, they don’t go. They’re there because they either want to feel a part of it, or support it, but in any case, they’re there because they _want_ it to succeed. Marketers know that, and try to make them feel like they’re part of it. Fans and marketers are each using the other to their own benefit, willingly. Today was my travel day back. I haven’t had time to read any internet reaction to any of all of this. But I have no doubt that out there in the greater internet you’ll find a good number of people denigrating the things announced at Comic-Con, and a number supporting them. Some of those people were in that audience. We all know the movie may fail, and we all know that those preceding it may fail. However, I'm hard-pressed to see anything wrong with people spending 60-90 minutes cheering. They’re not cheering because they’re expected to (though clearly marketing is doing its best to arrange things so they are cheering), they’re cheering because they want to feel connected, want to be a part of it, and want to hope that something they care about will succeed. I don't know about the big groups cheering (never was one for huge pr events in person, myself) but I am getting to be more ok with movie franchises - there is still the odd individual feature, but I think movies are a lot more like serialized TV now, and the way they are produced reflects that. TV is a lot more like movies, also, with complex and long storylines. It's all coming together, and the differences are mainly on budget, payscale, and venue, and less story. I think Ian @ Trade Reading Order nailed it - what we are seeing is a Hollywood that is somehow reverting to the Movie Serials format of the 30's and 40's by constantly looking for evergreen franchises. And it makes sense financially - but a franchise doesn't guarantee anything. X-men worked for a while, but then X-men 3 (and Wolverine Origins) sort of kill the golden goose. I totally agree on the confluence of movies & television. And that's not where I have a problem. I totally get the 3-picture contracts. But the thematic elements of the different properties are going to draw different audiences, and that's no guarantee that merging all the elements together will work. I do kind of see Anon's point, though, about WANTING it to succeed versus being told how it will. It's true - they are different. Just like a Hulk comic is going to be different from a Captain America comic. Or at least, classically they have been. The same writer on both books might make them seem familiar. But ideally they both appeal to comic fans. Or superhero fans - though "hero" means different things to cap and hulk. Etc? I'm guessing the film makers are banking on similar audience overlap. We'll see how it turns out. The show from the producers of theatrical films is updated quickly with the terrarium tv ultimate. Quality movie software provided by terrariumtvultimate.com a good website today.